My Theatre Matters! 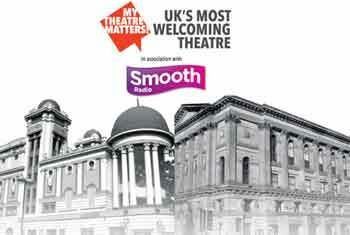 Most Welcoming Theatre Award, in association with Smooth Radio returns this September for a third year. UK Theatre Awards are the only nationwide Awards to honour outstanding achievement in regional theatre throughout England, Scotland, Wales and Northern Ireland. Two of Bradford Theatres venues St George’s Hall and the Alhambra Theatre are taking part and seeking the support of the public. “We pride ourselves at Bradford Theatres quite simply on the fact that we care. From initially booking your tickets all the way through to receiving discounted car parking vouchers, we excel at making customer visits enjoyable, whilst offering sincere Yorkshire hospitality. We understand that coming to the theatre or concert hall needs to be a memorable occasion, therefore our aim is to always meet and exceed our customers’ expectations. This award recognises the quality of customer care provided in entertainment venues across the UK, and we hope, with the help of the public, that our endeavours will be recognised. The Alhambra Theatre, the vision of Francis Laidler, a local impresario and theatre manager, was officially opened on 18 March 1914. Last year Bradford Theatres celebrated the Alhambra’s centenary throughout 2014, culminating in a gala evening ‘A Night of Variety’ starring Britain’s leading musical theatre star, Michael Ball in September 2014. The Alhambra Theatre has gone through many changes over the years. Most recently is the addition of the Laidler Lounge VIP Bar, a luxurious room where guests can relax and enjoy a glass of Champagne before the show and during the interval. The Laidler Lounge VIP Bar and Restaurant 1914 which opened in 2012, make wonderful additions to the theatre going experience. St George’s Hall was officially opened on 29 August 1853 by Queen Victoria and Prince Albert. Today St George's Hall is still renowned for its exceptional acoustics and intimate atmosphere. The venue is a popular choice for leading names from the music world as well as top stand-up comedians. The Hall also attracts big names in variety entertainment, receives regular children's shows and amateur productions and still continues to offer an increasingly exciting and diverse programme. Voting for My Theatre Matters Most Welcoming Theatre! award opens on Friday 4 September, visit www.mytheatrematters.com/vote-now before Friday 25 September and vote for St George’s Hall or the Alhambra Theatre and support Bradford's leading entertainment venues.